From 2006 to 2007, MPE Inc., Milwaukee, WI (with a second plant in Mexico), saw sales of its medical carts and tables, and similar fabricated-metal products and assemblies climb by nearly 10 percent. Impressive enough, but I really sat up and took notice when I learned that over that same time period its material costs dropped by $300,000. 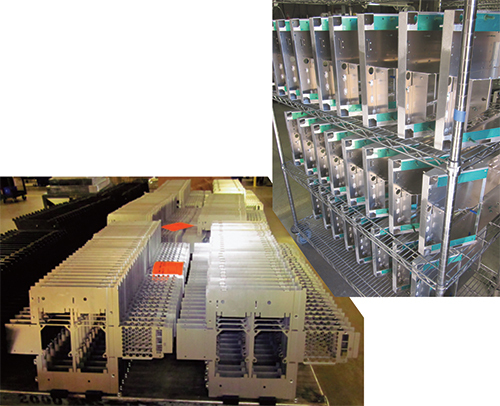 MPE manufactures an array of custom high-value carts, consoles and other similar products primarily for the medical industry. Quick-response manufacturing is helping the firm manage the growing trend by medical customers to hold less inventory, meaning average order quantities have shrunk from the hundreds to a lean 20 to 50. Specifically, material utilization on MPE’s combination turret/laser machines has jumped from 50 percent to 85 percent, and on stand-alone laser-cutting machines from 60 percent to as high as 95 percent. The secret to success: the switch from static nesting on separate software packages for its various machine models, to dynamic nesting with Jetcam software. MPE balances two types of customers and orders—it serves as a one-stop shop for OEMs looking for fabricating and assembly operations, and also as a job-shop supplier of parts. The medical industry dominates, comprising 70 to 80 percent of its load, although that percentage has been shrinking in recent years as the firm seeks to diversify. Diversification has brought customers such as electronic and telecommunication OEMs. While Grundel and his fellow associates are sleeping better these days due to more efficient nesting, there are a few challenges that keep their heads spinning. MPE processes orders for fabricated sheetmetal parts and assemblies at any of six CNC machines—three Mitsubishi laser-cutting machines and three Amada punch-laser combination machines. Forming occurs at an array of press brakes, from 20 to 275 ton, including an Amada Astro robotic-bending cell. 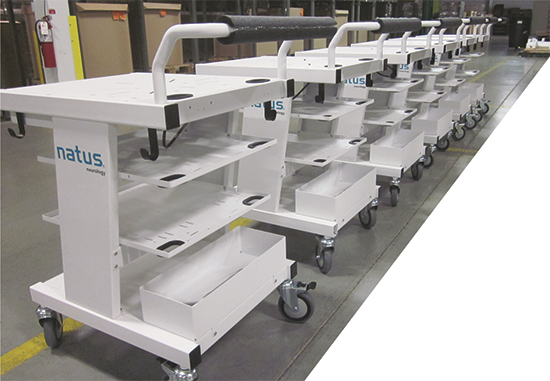 In turn, MPE’s average order quantity for medical carts, tables and the like has shrunk to a lean 20 to 50, down from average order quantities of several hundred just a few years ago. Here’s where manufacturing speed and the firm’s push toward quick-response manufacturing (QRM) enters the equation—both initiatives fueled in part by Jetcam. MPE created a cross-functional QRM team that includes two that can use Jetcam to produce sheet nests and send them to the floor for processing. Overall the company employs a dozen associates trained to use the software. Industrial engineers at MPE’s Milwaukee headquarters facility develop tooled-up part profiles for all of the firm’s CNC machines, including those at its Mexican plant, using Jetcam Expert Premium software. Processing occurs at any of six CNC machines —three Mitsubishi laser-cutting machines and three Amada punch-laser combination machines —the newest of which is an Amada EMLK punch-laser combo added in 2011. The industrial engineers at the Milwaukee headquarters also develop tooled-up part files for the firm’s laser-cutting and turret-punch presses at its Mexican plant in Apodaca, Nuevo Leon. QRM not only pays dividends within the walls of MPE; its customers see the difference as well. Example: In February 2013, the firm earned Global Supplier of the Year status for 2012 by its customer Draeger Corp., selected from a pool of 3000 global vendors. Recognition came due to MPE’s “ability to take complexity out of the supply chain and manufacturing processes along with its robust quality system and sound processes,” said Adam Nesbitt, Draeger director of strategic sourcing. MPE is a good case study in dynamic nesting—combining parts from more than one job, of like material type and thickness, onto shared sheet nests. 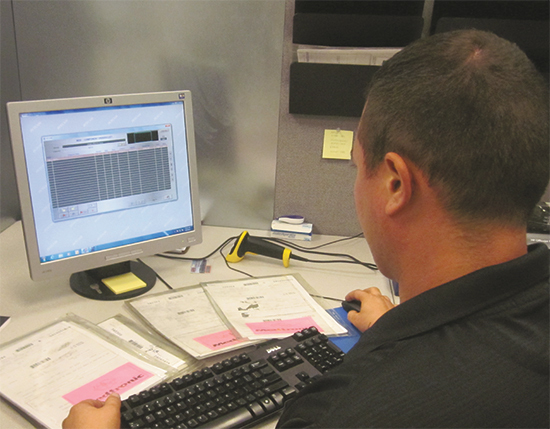 This practice, compared to static nesting of only one part design onto a sheet, contributes as much as anything else to improved material utilization, and to fewer concerns about inventory management. Once the process plan for contouring the parts (typically done by laser cutting) and punching interior part features is complete, the program is released to the production team for nesting. Here’s where the user friendliness of Jetcam really comes into play. MPE employs three floating seats of the software, shared by 12 users trained to use it—some for part programming only, others for programming and nesting. The QRM team includes two Jetcam users. All manufacturing software products evolve over time, often based on user recommendations, and Jetcam is no exception. One such recommendation from Grundel and his team, provided via NestOne, involved the spacing of parts on a nest to accommodate the width of the punching tool. Last but not least, Grundel describes another MPE-generated idea implemented by Jetcam to improve programming efficiency. See also: Nest One Solutions, Amada North America, Inc, JETCAM USA Inc. I get what MPE INC has accomlished however the question I have is "how does dynamic nesting work into an "erp" system ?. Production orders in a ERP stsyem are created for bom's and routes to a specified quantity per order. The routes and bom's have cycle time and material allocated to a specific order. Otherwords how is the customer charged for material and labor ?? ?